No matter if you’re headed to the beach, the pool, or just for a jump through the sprinkler in your back yard, you can stay fashionable with any one of these DIY swim suit cover ups! 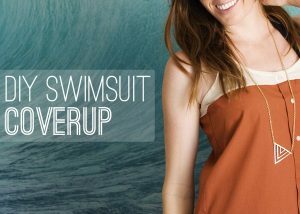 Sarah from The Winthrop Chronicles gives you step-by-step instructions for sewing up this comfy diy swimsuit cover up. Follow Kayla’s DIY Swimsuit Coverup tutorial at her style blog Freckles In April to create a fashionably cool cover up from two separate shirts. 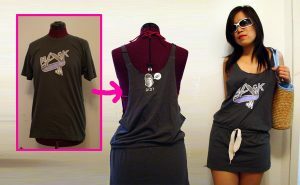 Diana Eng shares her swank T-shirt Tunic cover up tutorial at MAKE – take any oversized tee and turn it into a tunic. Don’t feel like sewing? No problem – check out these no-sew cover ups, where the only tools you need to create a cool cover-up are a pair of scissors! With just a few snips and knots, recycle a tee into a halter top tunic perfect for a swimsuit cover up. Follow along as Anne from WobiSobi shows you how! 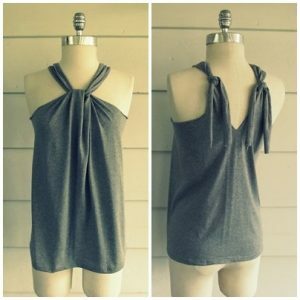 Make yourself a casual halter wrap with Auna’s DIY No-Sew Halter Wrap tutorial from her blog La Vie En Rose. Transform a rectangle of fabric with a pair of scissors into this casual cover up. Next Next post: We Celebrate Our Loyal Fans!